Of late I have been doing a lot of analysis around stock market sectors. In the past I hadn’t really paid too much attention to sector weighting, but during all the technical analysis I have been doing has let me to believe there probably is something to trying to allocate holdings by sector. I recently completed building my sector analysis model (see it here), and am test driving it to see if it can lead to enhanced returns in my portfolio. Fidelity’s opinion is that we are in the mid to late phase of the business sector, and that seems reasonable to me. So using the chart above should give you an idea as to what sectors to start thinking about over-weighting or under-weighting. One thing I realized when I started looking at my holdings by sector that I was way overweighted in the Technology and Consumer discretionary sectors. This is because I typically ‘buy what I know’, products or services that I use. I don’t think there is anything wrong in buying what you know, but this analysis has helped me keep better disciplined as to managing portfolio risk. 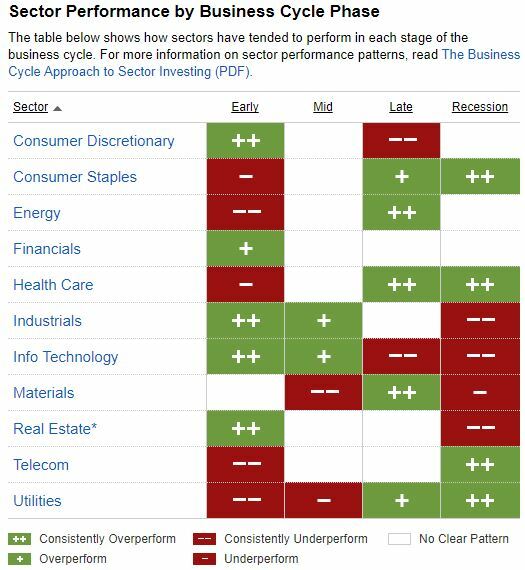 So its been an interesting dive into thinking about sectors, whether or not its meaningful or not only time will tell. I will be watching the market with a focus on sectors, and will see if this can be a tool to enhance portfolio performance.